Implant dentistry is often an involved venture for patients. Deep collaboration between the dentist, the surgeon, and an experienced laboratory technician is at the core of any successful implant case. 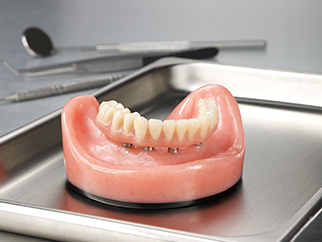 From the simplicity and flexibility of a single-tooth implant to the most complex full mouth rehabilitation, NDX laboratories possess the resources and experience necessary to create functional and lifelike smiles to meet any treatment plan. To simplify complex pricing structures often associated with implants, our Implant Bundles provide an easy-to-use system that allows clients to choose the right solution for the patient with the peace of mind that comes from a predictably priced case.